The motif of the newly restored home of JH Design Studio in historic Downtown Roswell echoes the creativity and business dynamic of owners Whitney Johnson and Barbara Horvath. With its sage green walls and vaulted wood ceiling, the space has the look and feel of a high-end salon, but Johnson and Horvath have personally selected warm accessories that give it a comfortable, approachable and inviting vibe—much like the team at JH Design Studio….comfortable, approachable and inviting. Many hair salons offer a variety of hair care services—an array of cut, color and chemical options. 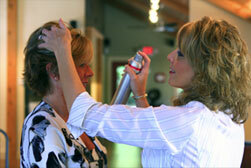 But JH Design Studio in Roswell is one of the rare salons that offers a hair care experience. From the moment you walk in the door of this soothing and sophisticated new salon, you are experienc­ing the finest in hair care hospitality and professionalism. What is it about the sunny blue-sky days and a blossoming chartreuse landscape that stirs us to open our windows, clean out closets and get a new hair style? The daffodils start blooming and instinctively I want a fresh new look! So when I found myself yearning for a new ‘do, I went to see Whitney Johnson, Barbara Horvath and Kristine Heick at JH Design Studio in Historic Roswell. They have the expertise of a high-end Buckhead salon without the intimidation factor.